British State Trumpeters bring that military style, uniformed in their distinctive trademark red tunics and bearskins. With long silver fanfare trumpets and their signature banners attached British State Trumpeters will add a touch of class, colour and pageantry to any dignified occasion. From 1 trumpeter to the full compliment of 8 plus timpani our specialist former professional military musicians are experienced at playing fanfare music and performing at any function including award ceremonies, major sporting events, graduation ceremonies, trade association banquets, corporate functions the list goes on and on. February 2014 saw four of our trumpeters perform at one of our annual engagements for the Federation Trade Annual Dinner at The Grosvenor House Hotel in London. 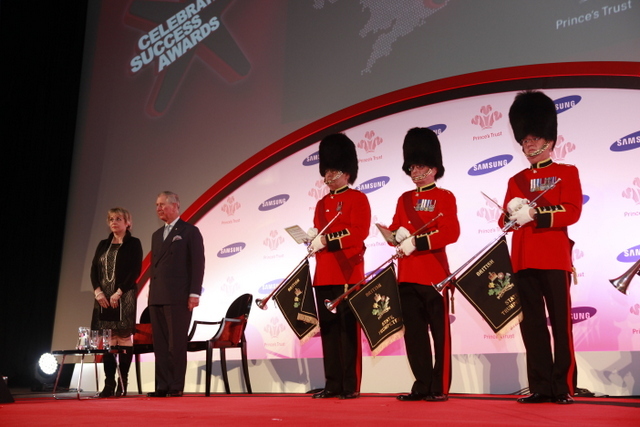 In March 2013 and 2014 our British State Trumpeters played fanfares in London for HRH Prince Charles at the annual Prince’s Trust Success Awards, presented by Ant & Dec.
April 2014 found two of out trumpeters playing fanfares at the Armourers & Brasiers Hall for visiting dignitaries from the Vatican. June 2014 saw eight of our fanfare trumpeters and two of our drummers open the Britain’s Got Talent Live Final on ITV with a TV audience of over 11 million viewers. We were also asked to play for a last minute booking at The Fishmongers Hall in London, playing fanfares for the Princess Royal. British State Trumpeters can also provide flag and sword bearers and a guard of honour. They are also able to provide a solo trumpeter to perform Last Post and Reveille for Remembrance Day Services. If your event requires quality, British State Trumpeters will impress your guests both visually and audibly with their unique performances and stunning uniforms. They will give that air of grandeur that will stay with your guests for a long time to come.